There are 2 artists with the name Ken Davis: 1. A New Age musician who's music is represented here. 2. An obscure Rock-A-Billy artist from the 1950's 1. Ken Davis the New Age Musician: Ken Davis cares for our world and life itself. 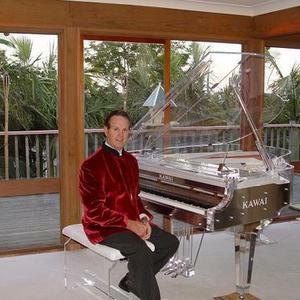 He lives in Sydney Australia where he creates his inspirational instrumental music. His career spans more than thirty years. His first relaxation release was *Feelings From Within* on cassette was in 1982. His music and nature sounds have reached every corner of the world from his live performances at the Sydney Opera House. 1. A New Age musician who's music is represented here. 1. Ken Davis the New Age Musician: Ken Davis cares for our world and life itself. He lives in Sydney Australia where he creates his inspirational instrumental music. His career spans more than thirty years. His first relaxation release was *Feelings From Within* on cassette was in 1982. His music and nature sounds have reached every corner of the world from his live performances at the Sydney Opera House. Ken composes music to heal and harmonize body mind and spirit. The music appeals to peoples minds who are searching for a positive and inspirational alternative to the aggression and disharmony that dominates our world today. The hectic pace of life in cities is so fast, so much that life itself has become very stressful. We need balance in our lives and soothing healing music provides the balance! Music speaks all languages! Ken's musical skills started in the school band in England at the age of nine where I was the lead trumpet player. My family came to Australia in 1963 and settled in Adelaide where I attended school. In 1970 after spending time in jobs ken liked but didn't love he dabbled with keyboards and began started composing music after picking up a guitar on a cruise ship going to England for my first overseas holiday, and to my surprise found the guitar easy to play. At the end of the cruise I could play The House Of The Rising Sun. He wrote his first song called **Do They Have to Kill The Wales**. This was a calling to assist the whales and dolphins to be protected worldwide and to help bring that focus to the world. Ken Davis is one of those almost obscure artists who were part of the 1950s rock n roll and rockabilly scene. As far as I know, he has been living in Racine, Wisconsin, ever since his birth in 1936. His first record came out in early 1958, on the tiny Pfau label from Milwaukee and was credited to Ken Davis and the Honey Bees (with "instrumental accompaniment by Buddy Nelson's Country Gentlemen"). "Sittin' Pretty"/"Bundle Of Lovin'" didn't even have a catalogue number and may have been the only release on Pfau. Both sides were marred by a female chorus, unfortunately. His next record, also in 1958, was better: "Uh Huh That's Right" on Star-Light, a label owned by Harry Smith in Davis's native Racine. This was soon followed by the record for which Ken is best known, "Shook Shake (Like A Big Mix [sic] Cake)", his own composition. The original release was on Star-Light, but Davis soon reissued the record on his own Badger label, this time with a correctly spelled subtitle ("Like A Big Mixed Cake"). An second Badger disc followed in 1959, "Gone Again", which, like "Shook Shake" has been reissued on several compilations. Unfortunately for Davis, ABC-Paramount backed out of taking over the label's national distribution at the last minute, and his two fine Badger singles went largely unnoticed at the time. One more single appeared, the countrified "The Next Little Town" on the Ken Davis label, but that would be his last release for several decades. He continued to perform, but usually only at local events and birthday parties. In 1998 some friends in the music business suggested to Ken to think seriously about going back into the recording studio and doing some of the songs he never got the chance to record years ago. It was always Ken's dream to put out an album, and this could lead to the opportunity of releasing a CD featuring the old and the new. So, just for the fun of it, Ken put together a group of musicians (Dean Lange, lead guitar ; Maggie Lange, electric bass ; Jon Bolton, drums) and went into the recording studio with them to put down eleven songs in August 1998. The engineers, Paul Dry and Tom Williams, assisted in capturing the "raw sound" of the 1950s. The result was a CD issued by Eagle Records in Germany for worldwide distribution : Ken Davis, "Echo Rock : His Complete Recordings" (Eagle 90128). It consists of 24 tracks : 10 remastered recordings from 1958-62, 3 unreleased demos and the entire August 1998 session, recorded at Miracle Sound Studio in Oak Creek, Wisconsin.